When colours were combined on new designs it was as if we’d collectively stepped back in time. The forms might have been contemporary but the colours were decidedly old-fashioned. Think fulsome burgandys, mustard yellows, olive greens, slate grey/blues and peachy putty pinks. These are proud, punchy colours and the overall effect was often heightened by their use as bold geometric prints and zany patterns. The point being, the colours may have belonged to a different era, but the designs looked bang up to date. 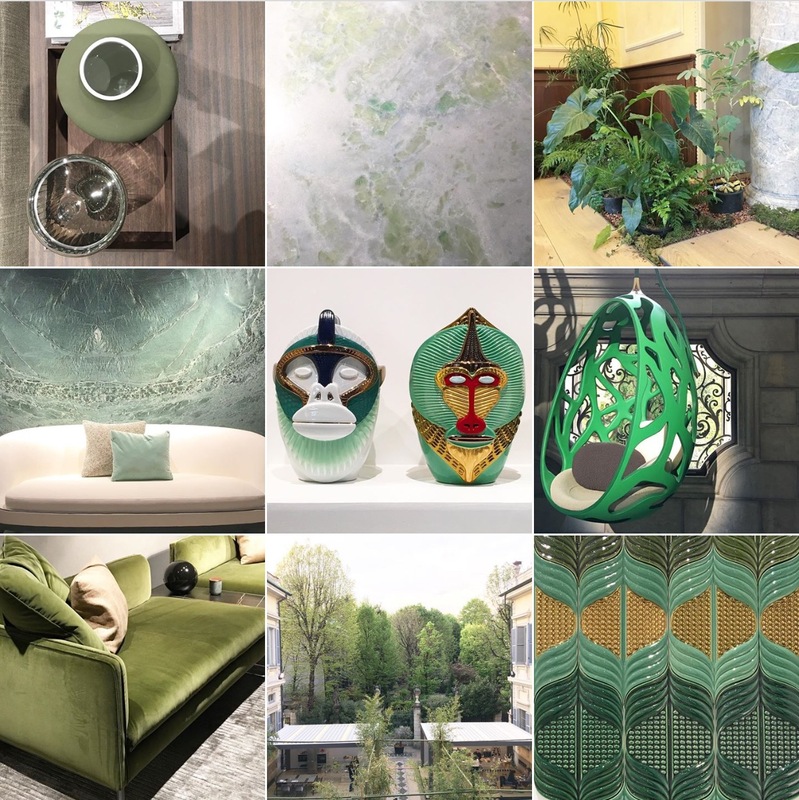 I’ve written before about the pleasures and power of green, but in Milan the love affair with all things verdant was taken to another level. Not only was physical greenery in abundance in the form of whole trees to plentiful planting as absolutely the look du jour on show stands, but green was present in many other forms too, from the luxurious velvet we’re perhaps already familiar with on sofas, to lustrous new marbles in a range of hues from pale mint to bright leafy tones. Ceramics and glass also took a turn in the green spotlight. Basically, the trends memo must have read, work some greenery into each and every set, whether faux or real, and whatever the material or finish, just do it. 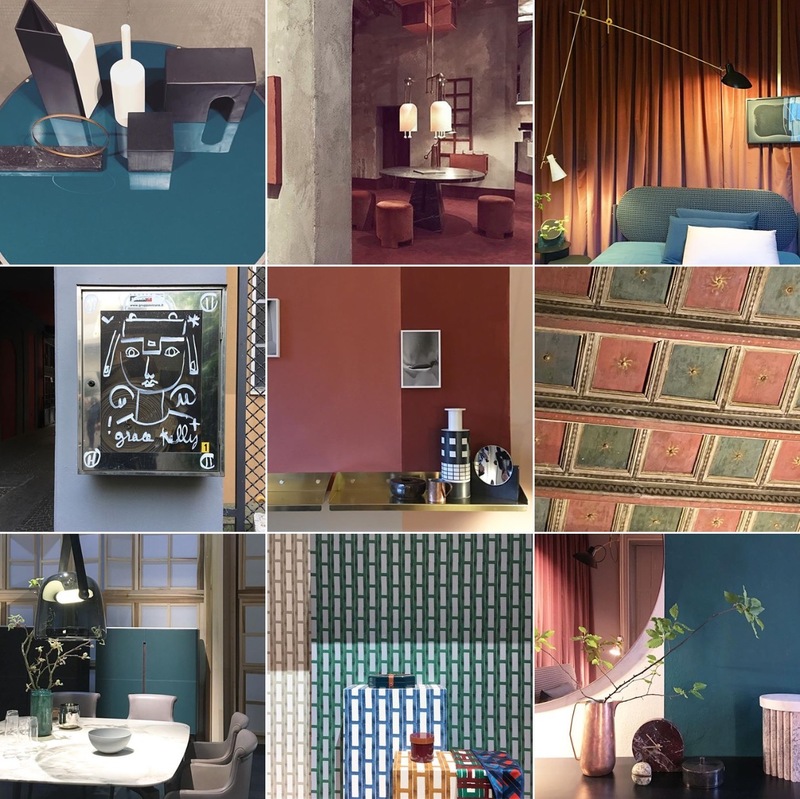 The only other set of shades to be seen in abundance were a family of colours that seemed to reflect the very environment in which we were seeking inspiration; Italy itself. Think painterly hues with names like burnt umber and raw sienna. 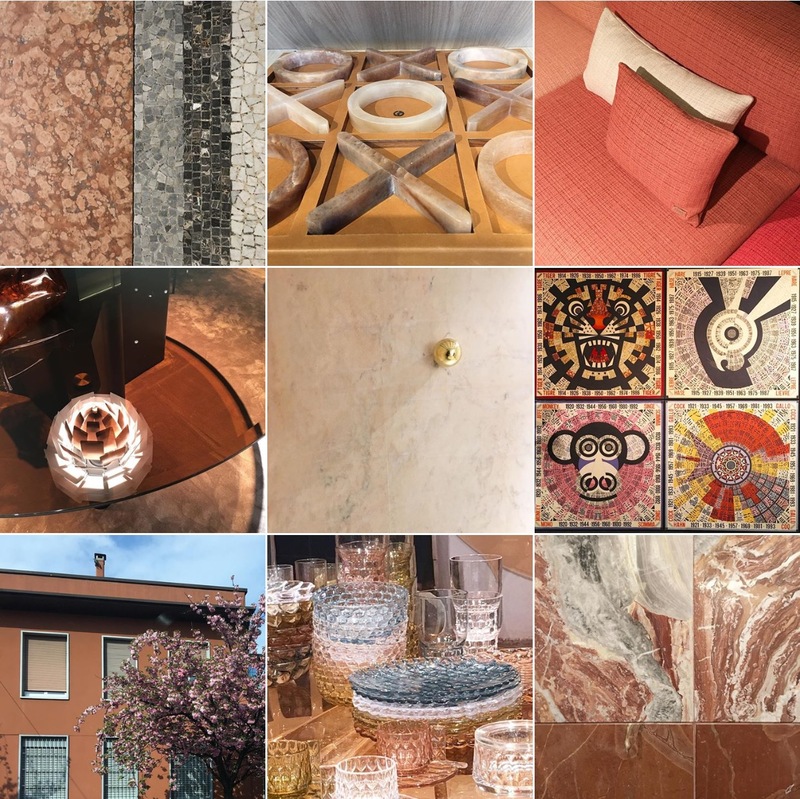 These are timeless colours that emanate from the surrounding earth (see Colour: Terracotta), but they were given a new spin in 2017 by being worked in combination with each other. And the peach end of the spectrum is the point at which this look coalesces with Trend No.1, 50s colours, making for a very coherent look. 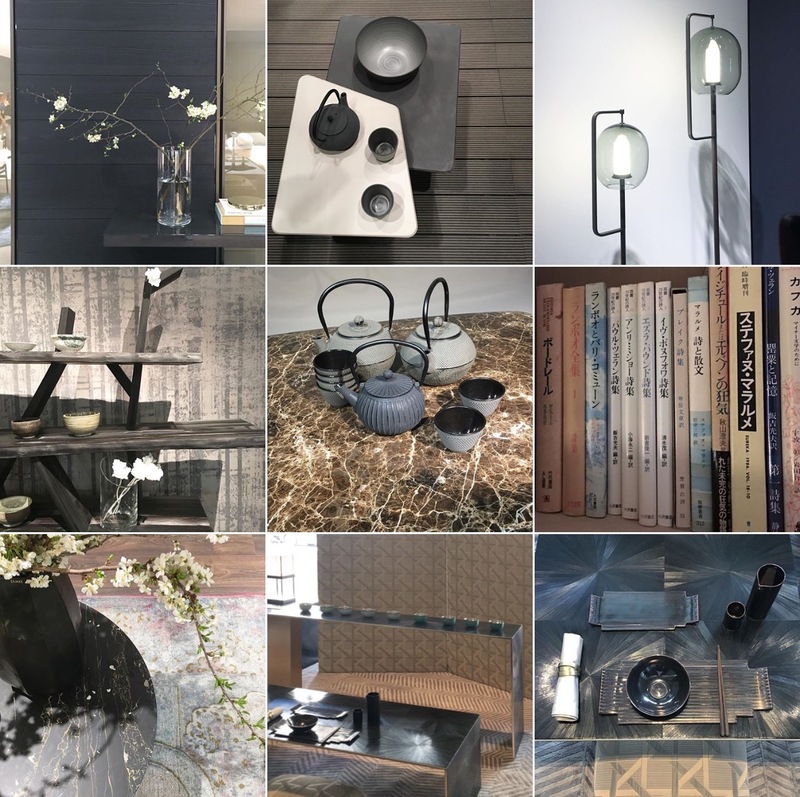 A previous post was devoted to the eternal appeal of Japanese design so it was exciting to see the larger design world concur. Japanese touches were everywhere, from the country’s native technique of charring wood to give it a deep black finish, to stylistic influences with the artful use of cherry blossom to decorate many a stand. Other Eastern accoutrements were also seen, from classic cast iron teapots to Shoji screens and Tatami mats. Japanese design has in my opinion a certain inherently timeless beauty, so it was refreshing to see this at large rather than more shouty, fashionable moves designed only to grab headlines. If new launches were not shown in a colour, then they were black. But never boring. A multitude of finishes reigned, from the charred wood referenced above, to glossy glazes and matt metallics. It looked strong, sophisticated and very chic. It also spoke to me of great confidence. 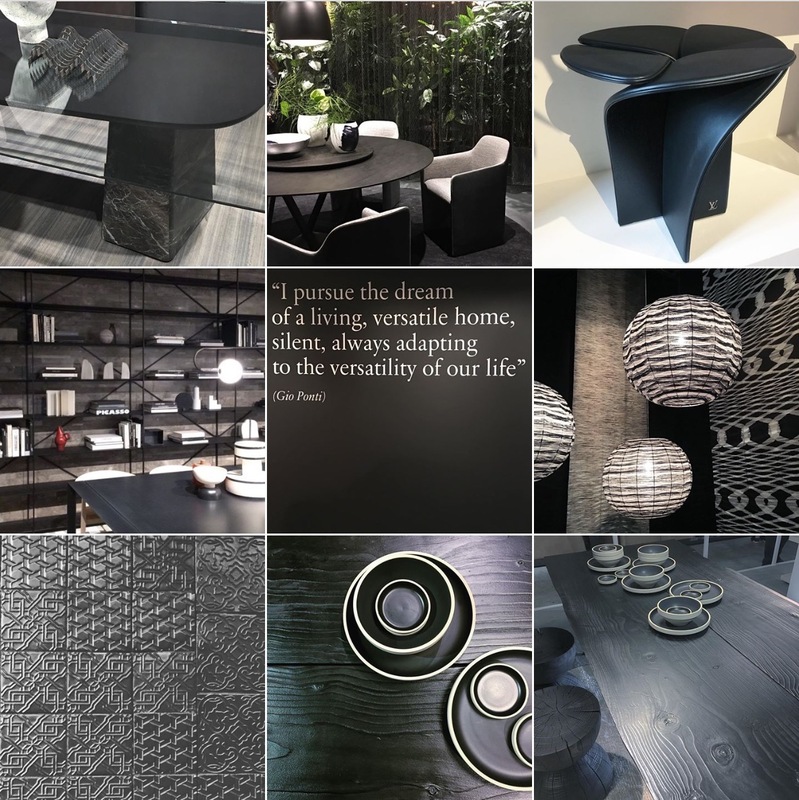 No matter that the little black dress in fashion can be a quiet default choice, in furniture, black is a statement. Black says look at me and marvel. 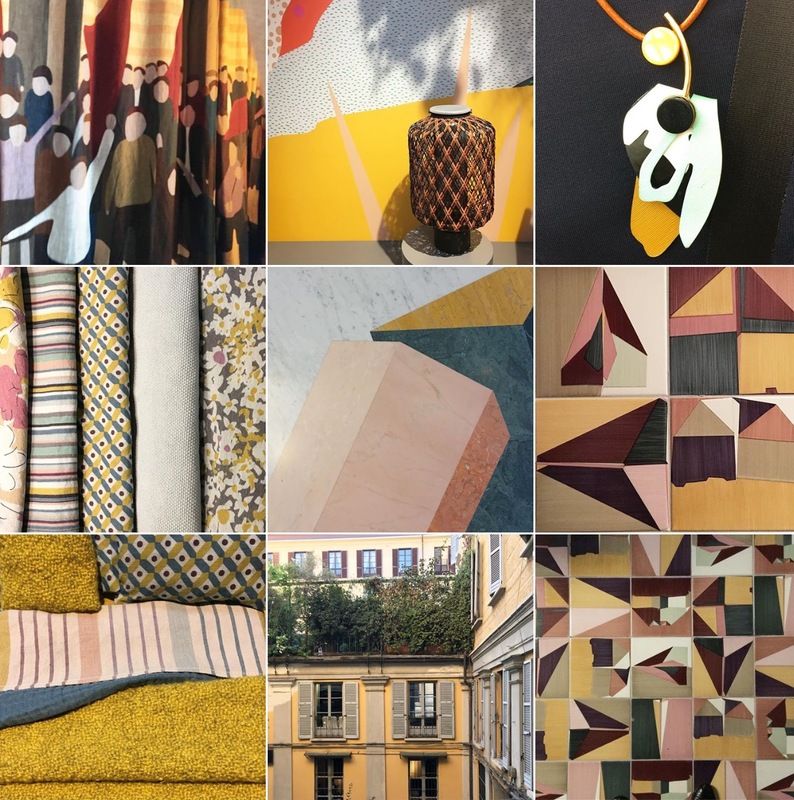 This trend hints at a gloriously celebratory palette that mixes with cheerful abandon colour, pattern, finish and material. Wood is worked alongside metal; ceramic with marble, prints with plains. This spoke to me, following Trend No.5, of an equally capricious attitude. It is an equally confident stance, but from a different point of view: a wonderful sense of joie de vivre and a deep pleasure in the material possibility of design. 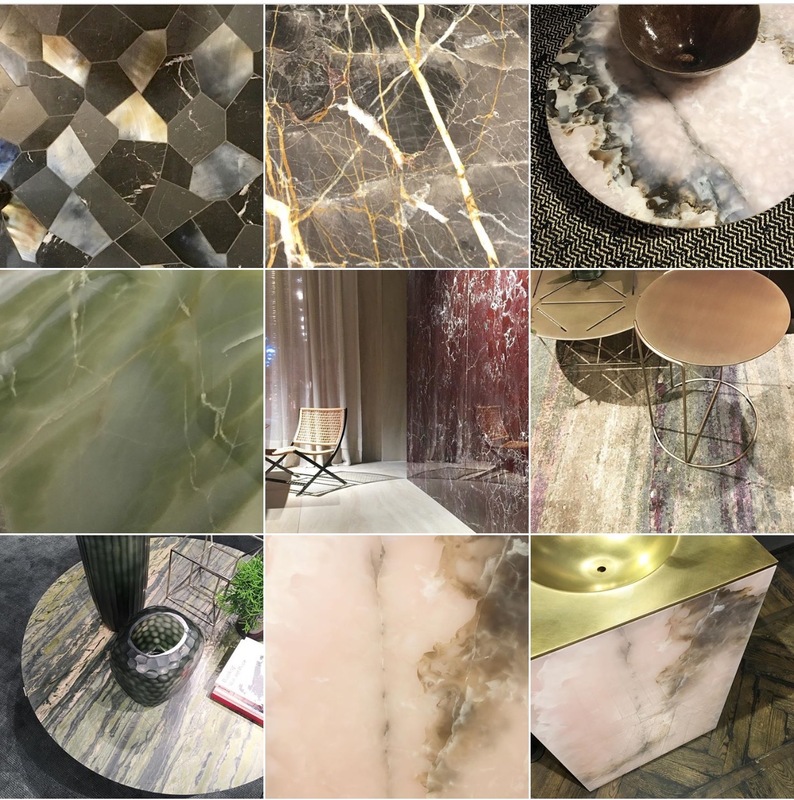 Marble has always been a favoured material of many designers, no doubt for its utterly unique patterns and colours. This year though it seemd like the competition was on to find the most lustrous or most unusual new stone. I marvelled at inky blacks traced through with veins of amber and gold. Green marbles as mentioned in Trend 2. Delicious burgandy reds and amber to terracotta variants, and Emperador, the rich brown stone with it’s creamy veins. But the stand out stone? Pink onyz. Managing to look both demure and arresting in one, this was a stone you instantly fell in love with, and began to imagine the perfect home for that delicious little sidetable that you would buy, and keep forever. This was a confident fair with clearly defined new directions, each of which rather wonderfully related to, and intertwined with, the other. It made for a very coherent picture and yet it was one that was also full of suprise and delight. The big brands experimented enough to offer new stories, but stayed away from obviously ‘fun’ moves. I took the prevalence of a Japanese influence to be very heartening as it reflected to me another side of confidence, one that is more about strength in simplicity, and the power of pure materials. The preponderance of Asian influences also reflected the receptivity of these markets to contemporary design. For example, Lazy Susans, a commonplace feature in Chinese homes, were everywhere! Although no-one I spoke to could recall how they got that ridiculous moniker.